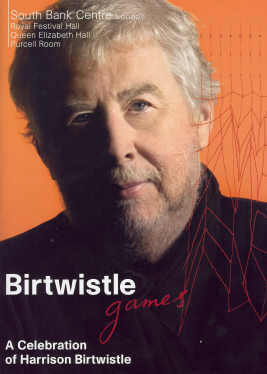 The extended festival Birtwistle Games, celebrating the 70th birthday of Sir Harrison Birtwistle, is purveying the music in varying presentations and perspectives. London Sinfonietta brough a strong programme of their commissions, with David Atherton back at the helm. Ritual Fragment (1990 in memory of Michael Vyner) illustrated the physicality which makes Birtwistle a composer best encounterred in live c, with the bass drum supplying a aritual continuity. People stay in their places for Silbury Air (1977), but this is one of the most haunting and endurable of his earlier works, inspired by prehistoric structures in Wiltshire, but in no way pictorialising landscape. Secret Theatre (1984) again has the players exchanging places continually, emerging from the ensemble and move to play in the cantus (an overlapping sequence of solo melodies) and returning to participate in the accompanying continuum (a harmonic and rhythmic framework over which the ritual is developed). Brief relaxation of intensity was provided by interspersing Birtwistles works with short pieces by Scelsi and Feldman, neither fully characteristic of their composers at their most memorable. Sir Harrison seemed typically uncomfortable in the pre-concert discussion session, looking at his watch and showing increasing disinterest in that ritual! Pierre-Laurent Aimard, on the other hand, struggled (very successfully) to explain in English the motives which had led to the unusual structure of his bi-partite recital sequences, juxtaposing Birtwistle's intricate piano writing against forerunners and influences, Messiaen, Ligeti, Bartók and Ravel. This was variably illuminating in the event. Birtwistle's Ostinato and Saraband would make for a good pairing of idiosyncratic melodies; his four Clocks we heard definitely benefited by separation, as did Messiaen's birds. But Ravel's Gibet came across as simply too beautiful, with not a hint of its macabre programme - it needs to be the still centre in the midst of the demonstrable virtuosity of its Gaspard frame. I thought we'd have the fifth (i.e. first) Harrison Clock as an encore, but there was none after Aimard, still fresh after a long talk plus recital evening, had leapt athletically off the platform and raced up to haul a reluctant composer down onto the stage and then disappeared to sign his CDs in the foyer! The Shadow of Night (2001)is one of Birtwistle's grandest orchestral works, a huge slow movement prompted by thoughts about "Melancolia" and Dowland's In darkness let me dwell. And this in turn prompted a concert scheme that stems from the Glock innovations in the Invitation Concerts of the BBC Third Programme (my son took part as a boy singer in one that was split between Musica Reservata (Dufay etc) and Maxwell Davies). Before the Philharmonia Orchestra and Birtwistle under Christoph von Dohnányi, we had a full hour of Dowland in the Royal Festival Hall, played and sung in an intimate manner by the New London Consort with singers Joanne Lunn and Michael George, who moderated his powerful baritone. In this age of amplification everywhere (I'm not reviewing a concert of Iranian music in QEH last week, completely ruined by overloud, distorted and unnecessary amplification) it was salutary to be allowed to be drawn into the music instead of having it thrown at you. A high proportion of Dowland's songs are, of course, slow and gloomy, but there were too a few of the delicious lighter ones, finishing with Fine knacks for ladies. Joanne Lunn was a special delight, with a pure steady tone and immaculate delivery. But she was less comfortable after the interval singing In darkness let me dwell stuck in the middle of the orchestra; it lay too low for her. Nor was giving that song between Birtwistle's latest orchestral work, Night's Black Bird (2004), a pendant to The Shadow of Night, as successful in the event as it looked good on paper. And rather than giving the sequel as prologue, I would have preferred the London premiere of the Lucerne/Cleveland commission to have been an epilogue to its companion, the huge 'slow and reflective nocturne'. But this was, all in all, a notable and thought-provoking evening; no doubt the Shadow and the Blackbird will arrive soon on CD, possibly with the Dowland song too, and you will be able to hear them at home in whichever order you please!